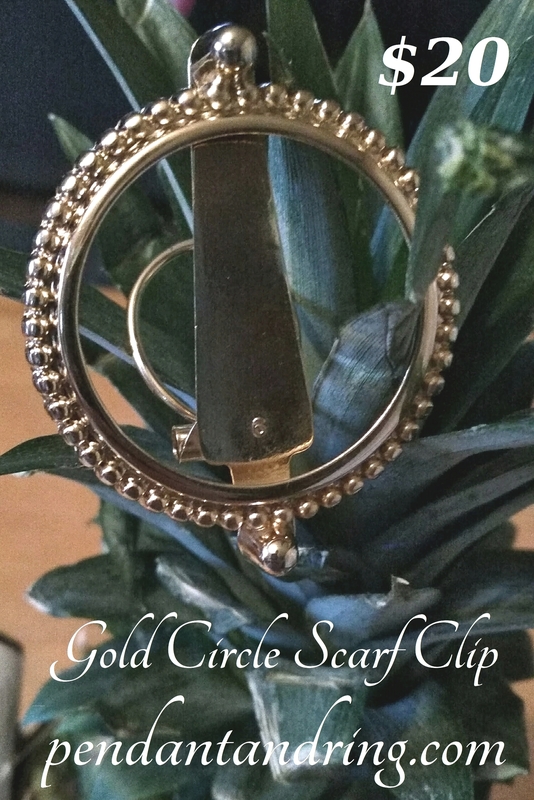 This sturdy metal scarf clip is reliable; it will not crack and break like a plastic scarf clip. The screws used in the construction of this scarf clip are easy to loosen for luxurious thick scarves, or tighten for thin and silky scarves. It is 5.5cm (2 1/4 inches) across at the widest point. There are many ways to wear a scarf and the following directions only provide one way. With everything on Pendant and Ring, we hope you wear it your way. Thread the scarf through the circle, from the back side, over the center bar, and back through the circle. Drape the scarf around your neck with the decorative side of the clip facing out. Align the scarf ends as you like. Turn the scarf clip over, in one hand and open the clip. Slip the other leg of the scarf beneath the end of the clip then close the clasp. Turn the clip over and adjust as needed so the scarf lays flat and the clip is facing forward. and pin this for later!